This is the part 3 of the series. Here are the other parts of the series. In the previous blogs, I have shown how to create a web based application to allow users to subscribe multiple channels on jetty embedded server. However, they still cannot see any data from those channels because there is no data being fed onto them. In the following, I will show how to create a java application to feed data onto the channel. The ChannelFeeder is the generic middle man program. It reads from input and sends it immediately to the designate channel. It requires a named channel as an input argument (such /123. /sar. etc) which were defined in part 2. // Fill in the data. Publishing data on a channel is an asynchronous operation. This will allow you to key in anything from the screen, and the result will be sent to the channel 123. If the user choose channel 123 from the web browser, it will subscribe to it and see whatever you type from that onward. ./feed.bash stopwatch is to activate Stopwatch.java program. It just a count-down second by second java program. I will provide this program in another blog. ./feed.bash sar will pipe unix ‘sar -u 2 10000’ command output to the ‘sar’ for those subscribers where they can watch real time feed from remote browser. This will apply for the rest option like iostat, vmstat and ifstat. All of these are just the simulation of the devices. The likely application for these technologies are for field devices in transportation systems, the appliance devices in home automation etc. The following script should open many tabs in your terminal and feed all the channels. This can use to stress test your machine. For my 2GB machine, I only can run these 6 times, and the system is totally unresponsive after it. gnome-terminal --tab --title=123 -e "$1/feed 123"  --tab --title=stopwatch -e "$1/feed stopwatch" --tab --title=sar -e "$1/feed sar" --tab --title=iostat -e "$1/feed iostat" --tab --title=vmstat -e "$1/feed vmstat" --tab --title=ifstat -e "$1/feed ifstat"
This is the part 2 of the serial. Here is the other parts of the series. In the part 1 of this serial, I created a project DeviceMonitort by using mvn. In the following, I will modify the web application to support multi-channels subscription based web application housing on Jetty 7 embedded server. First, I will replace the index.jsp with there html files: index.html, frameleft.html and frameright.html. Here I demonstrates multiple channel selections on the left frame, and users can choose whatever predefined channels they want to subscribe. In fact, the channel name can be generalized as anything. The device.jsp file is modified from index.jsp. It allows the parameterized channelName to be passed to dev.js. The jquery dev.js is modified from application.js, and is called by device.jsp above, and it subscribes to config.channelName. For example, click channel ‘/sar’ and you will subscribe to /sar. Of course, you just get the following screen because there isn’t any data feed onto the channel. In the next post, I will show how to develop a java application to feed data onto the channel. Sometimes it is hard to keep track of which web server and browser are supporting Comet and/or WebSocket. The following is from JFarcand, the developer of Grizzly and Atmosphere framework. The web has been largely built around the so-called request/response paradigm of HTTP. A client loads up a web page and then nothing happens until the user clicks onto the next page. Around 2005, AJAX started to make the web feel more dynamic. Still, all HTTP communication was steered by the client, which required user interaction or periodic polling to load new data from the server. Technologies that enable the server to send data to the client in the very moment when it knows that new data is available have been around for quite some time. They go by names such as “Push” or “Comet”. One of the most common hacks to create the illusion of a server initiated connection is called long polling. With long polling, the client opens an HTTP connection to the server which keeps it open until sending response. Whenever the server actually has new data it sends the response. Long polling and the other techniques work quite well. You use them every day in applications such as GMail chat. WebSockets is a draft standard which is sponsored by Google, Apple and others at the WhatWG working group that is standardising HTML 5. As a result, HTML 5 capable browsers (Chrome, Safari) are starting to include built-in support for the WebSocket protocol. Both protocols aim to allow web-based AJAX applications to communicate with other services via asynchronous messaging or socket-based connections, rather than having to roll your own communications layer on top of an existing application. This allows the design of an application to focus on the component parts, and hand off messages to the communication layer for delivery. In addition, both can set up long-running connections such that events can be delivered asynchronously subsequently to the application. This is nothing new: HTTP 1.1 supported connection pipelining (the ability to keep open a connection after each request, and the ability to send multiple requests before the first was acknowledged); and other protocols like IMAP supported the IDLE command to put a connection into a hibernate state, where there is no ongoing communication but the server can push new messages at any time. Indeed, prior to either Bayeux or WebSockets, the term “HTTP Push” was used to indicate a general mechanism for long-lasting communication channel across HTTP. The real challenge is HOW TO MAINTAIN THE CONNECTION! A connection that hasn’t had any data over a period of time may be considered to have died, and arbitrarily terminated, at some point in the future. To address this, the IMAP IDLE suggests that clients send a re-negotiated IMAP IDLE command every 29 minutes to avoid disconnection. With other proxies in the way of HTTP, it may be that a proxy determines that a connection is idle and drops the connection, even if the client and server agree to maintain an ongoing connection. The other problem is resource-based; generally, browsers limit the number of concurrent HTTP connections to a single server to avoid overbearing the server (or the network link). It’s common for browsers to limit such concurrent connections to between 2 and 4 at any one time. Both Bayeux and WebSockets attempt to avoid the resource limits by using a fall-back mechanism for long polling (in the case of Bayeux) or switching to a non-HTTP based secondary protocol instead. As a result, users of these libraries don’t generally have to worry about limitations placed on them by the browser or infrastructure. CometD 2 now supports both Bayeux, and Websocket (which as an alternative transport to the currently supported JSON long polling and JSONP callback polling). 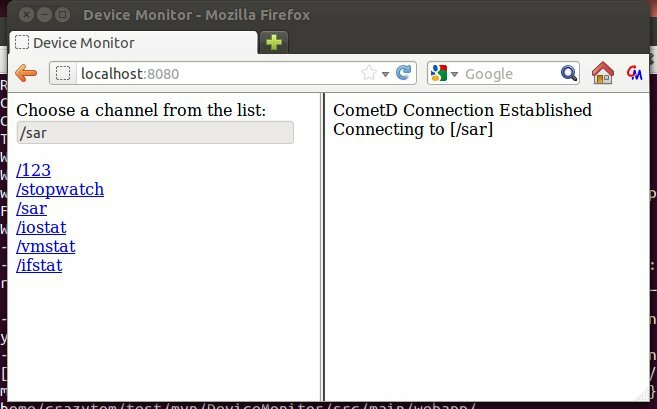 CometD is transparent to browsers with or without websocket support. Websocket usage will be able to give us even better throughput and latency for cometd than the already impressive results achieved with long polling. The OrderSaveServlet is the controller to save the CustomerBean from the session memory to a table “customer” in MySQL database via JNDI connection pool on GlassFish Application Server. It obtains the generated customer id from the database. Then, it saves the OrderBean and customer id into a another table “orders” in the database, and obtains the order id generated by the database insertion. It finally generates a html page to display the order number back to user. And our Order Entry Web System will end here. This JSP saves the order entry information passed by the last JSP to the OrderBean memory structure first, then retrieves those information back to display on top the screen. It also allows the user to entre their information quantity,Finally, it passed the control to OrderConfirm.jsp. This JSP saves the customer information passed by the last JSP to the CustomerBean memory structure first, then retrieves those information back to display on top the screen. Finally, it passed the control to OrderSaveServlet. In the following series, a typical web based order entry application will be discussed by using JavaSerer Pages, Java Servlets, JQuery and Java Beans (both data bean and command bean). It targets on any java based web server and relational DBMS althought it has been tested on Glassfish Open Source Server and MySQL database server only. In this first part, I will discuss the component web flow chart and the starting page control first . Then, I will focus on the model part of MVC design pattern: its database tables (persistence) and its mapped memory structures Java Data Bean (volatile) . display order id once the order entry completed. The servlet retrieves the selected item from the database based on an order id, and passed the result set to OrderEntry.jsp. This bean is a memory structure with a scope of session to hold the order data chosen or entered by user from the OrderEntry.jsp. 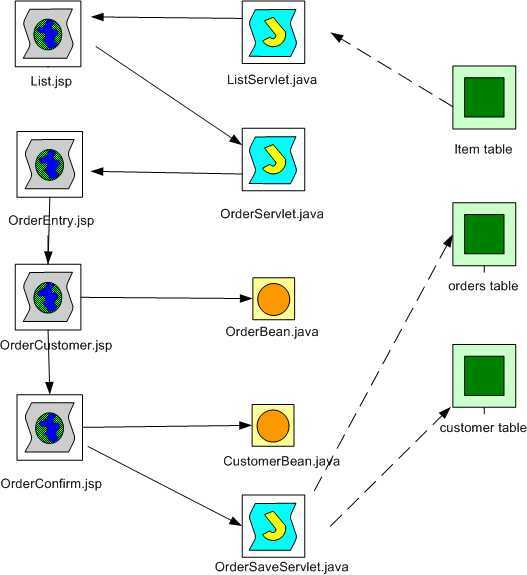 This bean is a memory structure with a scope of session to hold the customer data entered by user from the OrderCustomer.jsp. Fed Reserve Bank (San Francisco ) Ask: Is It Still Worth Going to College?